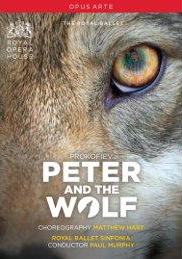 Opus Arte have announced the expected DVD release of The Royal Opera House’s performance of Matthew Hart’s Peter & The Wolf, to be September 1st 2011! It is currently on Pre-Order and has been directed for Television by Ross MacGibbon. The production was recorded live at the Royal Opera House 16 & 18 December 2010. (and had fantastic reviews). Will plays the Grandfather and Narrates wonderfully to Prokofiev’s score played by the Royal Ballet Sinfonia, conducted by Paul Murphy. If this recording manages to capture even half the magic and quality of the stage performance, it is sure to be a winner! You are currently browsing the WillKemp.org blog archives for July, 2011.